This article is about the SpaceX spacecraft class. For the biplane known as the "Dragon 2", see de Havilland Dragon. For the 2005 cartoon TV movie, see Dragons II: The Metal Ages. An uncrewed Crew Dragon 2 approaching the International Space Station (ISS) for its maiden flight. Dragon 2 is a class of reusable spacecraft developed and manufactured by American aerospace manufacturer SpaceX, conceived as the successor to the Dragon cargo spacecraft. The spacecraft are designed for launches atop a Falcon 9 Block 5 rocket and a splashdown return. In comparison to its predecessor, it has larger windows, new flight computers and avionics, redesigned solar arrays, and a modified outer mold line. The spacecraft is planed to be built in two variants – Crew Dragon, a human-rated capsule capable of carrying up to seven astronauts, and Cargo Dragon, an updated replacement for the original Dragon. Cargo Dragon capsules are repurposed flown Crew Dragon capsules. Crew Dragon is uniquely equipped with a set of four side-mounted thruster pods with two SuperDraco engines each, which serve as a launch escape system. Both variants have been contracted for use with logistical operations of the International Space Station (ISS) under Commercial Resupply Services 2 (CRS2) and the Commercial Crew Program. Development on Dragon 2 began with the moniker DragonRider in 2010, when NASA began searching for private operators for crewed flights to the ISS under the Commercial Crew Development program. Its design was publicly unveiled in May 2014, and in October 2014 was selected alongside Boeing's CST-100 Starliner to be developed for flight under the program. Considered by NASA as the least expensive option, US$2.6 billion was awarded to SpaceX to continue development of the spacecraft, in contrast to the US$4.2 billion awarded to Boeing. Crew Dragon's first non-piloted test flight to the ISS launched in March 2019, and its first crewed flight to the ISS is planned to occur in July 2019. Cargo Dragon was also selected in January 2016 alongside Northrop Grumman Innovation Systems' Cygnus and Sierra Nevada Corporation's Dream Chaser for cargo delivery flights under CRS2 contracts. SpaceX's initial CRS2 mission with the Cargo Dragon is slated to occur in August 2020 after SpaceX's final CRS mission with the original Dragon spacecraft, which is expected to launch no earlier than January 2020. 2012 DragonRider mockup, showing the launch escape system engines mounted on the outside of the capsule, when the design was not yet final. Depictions of the Crew Dragon's 2014 design from various angles. Visible changes that occurred since then include the removal of the hatch and back windows. The DM-1 Dragon 2 capsule at SpaceX's LC-39A Horizontal Integration Facility. Dragon 2 has two variants: Crew Dragon and Cargo Dragon. Crew Dragon was initially called DragonRider and it was intended from the beginning to support a crew of seven or a combination of crew and cargo. It was planned to be able to perform fully autonomous rendezvous and docking with manual override ability; and was designed to use the NASA Docking System (NDS) to dock to the ISS. For typical missions, DragonRider would remain docked to the ISS for a period of 180 days, but would be designed to be able to do so for 210 days, the same as the Russian Soyuz spacecraft. From the earliest design concepts which were publicly released in 2010, SpaceX planned to use an integrated pusher launch escape system for the Dragon spacecraft, claiming several advantages over the tractor detachable tower approach used on most prior crewed spacecraft. These advantages included the provision for crew escape all the way to orbit, reusability of the escape system, improved crew safety due to eliminating a stage separation, and the ability to use the escape engines during landings for a precise solid earth landing of the capsule. SpaceX originally intended to certify their propulsive landing scheme, in parallel with the parachute-to-water-landing method for Dragon 2, with the goal to hold to the development schedule and "ensure U.S. crew transportation safely and reliably in 2017." SpaceX announced that "land landing will become the baseline for the early post-certification missions" while precision water landing under parachutes was proposed to NASA as "the baseline return and recovery approach for the first few flights of Crew Dragon." Thus the parachute system was initially anticipated to be only a backup system; due to the cancellation of propulsive landing, however, the parachute system will be used for all landings. As of 2011[update], the Paragon Space Development Corporation was assisting in developing DragonRider's life support system. In 2012, SpaceX was in talks with Orbital Outfitters about developing space suits to wear during launch and re-entry. At a NASA news conference on May 18, 2012, SpaceX confirmed again that their target launch price for crewed Dragon flights is $160 million, or $20 million per seat if the maximum crew of 7 is aboard, and if NASA orders at least four DragonRider flights per year. This contrasts with the 2014 Soyuz launch price of $76,000,000 per seat for NASA astronauts. The spacecraft's design was unveiled on May 29, 2014, during a press event at SpaceX headquarters in Hawthorne, California. In October 2014, NASA selected the Dragon spacecraft as one of the candidates to fly American astronauts to the International Space Station under the Commercial Crew Program. SpaceX plans to use the Falcon 9 Block 5 launch vehicle for launching Dragon 2. Reusability: partly reusable; can be flown multiple times, resulting in a significant cost reduction. Dragon 2 is only planned to fly crew on the first flight of a particular capsule, while future flights of a capsule would carry only cargo. Landing: four main parachutes for water landing; possibility of developing propulsive landing using the SuperDraco engines. Engines (crewed variant): eight side-mounted SuperDraco engines, clustered in redundant pairs in four engine pods, with each engine able to produce 71 kilonewtons (16,000 lbf) of thrust Each pod—called a "quad" by SpaceX—contains two SuperDraco engines plus four Draco thrusters. "Nominally, only two quads are used for on-orbit propulsion with the Dracos and two quads are reserved for propulsive landing using the SuperDracos." Engines (cargo variant): four Draco thrusters per pod with four pods, used for orbital maneuvers. A 3D-printed rocket engine: the SuperDraco Engine combustion chamber is printed of Inconel, an alloy of nickel and iron, using a process of direct metal laser sintering. Engines are contained in a protective nacelle to prevent fault propagation if an engine fails. Docking: able to autonomously dock to space stations. Dragon V1 used berthing, a non-autonomous means to attach to the ISS that was completed by use of the Canadarm2 robotic arm. Pilots retain the ability to park the spacecraft using manual controls if needed. Cabin depressurization protection: the spacecraft can be operated in full vacuum, and "the crew will wear SpaceX-designed space suits to protect them from a rapid cabin depressurization emergency event". Also, the spacecraft will be able to return safely if a leak occurs "of up to an equivalent orifice of 0.25 inches [6.35 mm] in diameter." Movable ballast sled: to allow more precise attitude control of the spacecraft during the atmospheric entry phase of the return to Earth and more accurate control of the landing ellipse location. Trunk: the third structural element of the spacecraft, which contains the solar arrays, heat-removal radiators, and will provide aerodynamic stability during emergency aborts. Parachute landing with propulsive assist, similar to that used by the Soyuz: "The whole landing system is designed so that it’s survivable if there’s no propulsive assist at all. So if you come down chutes only with the landing legs, we anticipate no crew injury. It’ll be kind of like landing in the Soyuz." On July 19, 2017, Elon Musk announced that propulsive landing development had been halted and all landings would be under parachute followed by splashdown. The SuperDraco engines would still be used for emergency aborts, but there would be no landing legs. The effort to qualify propulsive landing for safety as well as the lack of technology commonalities with their ultimate Starship was given as a reason. However, pending approval from NASA, the SuperDraco engines can still be used for propulsive landings in case multiple parachutes fail. The parachute system was fully redesigned from the one used in the prior Dragon capsule, due to the need to deploy the parachutes under a variety of launch abort scenarios. Dragon crew members will wear a custom space suit designed to protect them during rapid cabin depressurization. It is intended to be worn only inside a pressurized spacecraft for intravehicular activities (IVA type). The suit can also provide cooling for astronauts during normal flight. For the SpX-DM1 test, a test dummy nicknamed Ripley was fitted with the spacesuit and sensors. Maiden flight of the Dragon 2 atop a Falcon 9. Dragon has been designed to fulfill a set of mission requirements that will make the capsule useful to both commercial and government customers. SpaceX and Bigelow Aerospace are working together to support round-trip transport of commercial passengers to low Earth orbit (LEO) destinations such as the planned Bigelow Commercial Space Station. In that use, the full passenger capacity of seven passengers is planned to be used. SpaceX competed for a contract with NASA to deliver some number of specific crew-transport missions to the ISS under the third phase of the Commercial Crew Development program. In an August 2014 presentation, SpaceX revealed that if NASA chooses to use the Dragon 2 space capsule under a Commercial Crew Transportation Capability (CCtCap, Commercial Crew Development) contract, then only four of the seven possible seats would be used for carrying NASA-designated passengers to the ISS, as NASA would like to use the added payload mass and volume ability to carry pressurized cargo. Also, all NASA landings of Dragon 2 are planned to initially use the propulsive deceleration ability of the SuperDraco engines only for a propulsive assist right before final touchdown, and would otherwise use parachutes "all the way down." On 16 September 2014, NASA announced that SpaceX, together with Boeing, has been selected to provide crew transport ability to ISS. SpaceX will receive $2.6 billion under this contract. NASA considers Dragon to be the least expensive proposal. Comparing the Dragon to the Boeing CST-100, NASA's William H. Gerstenmaier considers the CST-100 proposal the stronger of the two. 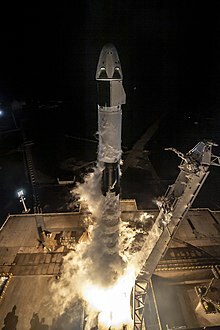 In a departure from prior NASA practice during the first five decades of the space age, where NASA contracted with commercial firms to build spaceflight equipment and then NASA operated the spacecraft directly, NASA is purchasing space transport services from SpaceX with the Dragon 2 contract, and will leave the launch, transit, and operation of the spacecraft to SpaceX. SpaceX has contracted to fly a number of crewed flights to low-Earth orbit (LEO) for the US space agency NASA. These flights are slated to begin no earlier than June 2019, with an automated test mission to the International Space Station (ISS) launched on March 2, 2019. In August 2018, NASA and SpaceX agreed on the loading procedures for propellants, vehicle fluids and crew. High-pressure helium will be loaded first, followed by the passengers approximately two hours prior to scheduled launch; the ground crew will then depart the launch pad and remove to a safe distance. The launch escape system will be activated approximately 40 minutes prior to launch, with propellant loading commencing several minutes later. SpaceX planned a series of four flight tests for the Dragon 2 that included both a "pad abort" test, an in-flight abort test, plus both an uncrewed robotic orbital flight to the ISS, and finally a 14-day crewed demonstration mission to the ISS, currently planned for 2019. In August 2014, it was announced that the pad abort test would occur in Florida, at SpaceX's leased pad at SLC-40, and the test was conducted successfully on 6 May 2015. Dragon landed safely in the ocean to the east of the launchpad 99 seconds later. While a flight-like Dragon 2 and trunk were used for the pad abort test, they rested atop a truss structure for the test rather than a full Falcon 9 rocket. A crash test dummy embedded with a suite of sensors was placed inside the test vehicle to record acceleration loads and forces at the crew seat, while the remaining six seats were loaded with weights to simulate full-passenger-load weight. The test objective was to demonstrate sufficient total impulse, thrust and controllability to conduct a safe pad abort. A fuel mixture ratio issue was detected after the flight in one of the eight SuperDraco engines, but did not materially affect the flight. On 24 November 2015, SpaceX conducted a test of Dragon 2's hovering abilities at the firm's rocket development facility in McGregor, Texas. In a video published by the firm, the spacecraft is shown suspended by a hoisting cable and igniting its SuperDraco engines. The capsule hovers in equilibrium for about 5 seconds, kept in balance by its 8 engines firing at reduced thrust to compensate exactly for gravity. The video shows the second test of the two-part milestone under NASA's Commercial Crew Development contract with SpaceX. The first test, a short firing of the engines intended to verify a healthy propulsion system, was completed two days earlier on 22 November. The test vehicle was the same capsule that performed the pad abort test earlier in 2015; it was nicknamed DragonFly. SpaceX plans to conduct an in-flight abort test from Kennedy Space Center Launch Complex 39A in Florida after the first uncrewed orbital test flight and prior to the first crewed test flight. The test is planned to be conducted approximately in June 2019 with the refurbished capsule from the uncrewed test flight. Earlier, this test had been scheduled before the uncrewed orbital test, however, SpaceX and NASA consider it safer to use the more recently designed capsule rather than the older test article from the pad abort test. The Dragon 2 test capsule will be launched in a sub-orbital flight to conduct a separation and abort scenario in the troposphere at transonic velocities, at max. Q, where the vehicle experiences maximum aerodynamic pressure. The test objective is to demonstrate the ability to safely move away from the ascending rocket under the most challenging atmospheric conditions of the flight trajectory, imposing the worst structural stress of a real flight on the rocket and spacecraft. The capsule will then splash down in the ocean with traditional parachutes, possibly with assistance of its integrated thrusters to smooth the final moments of the descent. The in-flight abort capsule was originally planned to launch on F9R Dev2 before the Falcon 9 Full Thrust vehicle (and its densified propellants) made F9R Dev2 incompatible with both of SpaceX's active orbital launch pads. Then a special version of the Falcon 9 first stage with just three engines was prepared for this test and carried to the launch pad at Vandenberg in April 2015 to conduct a tanking test. It was erected on the revised and rebuilt transporter erector (TE) and fully loaded with propellants on 9 April 2015 to test both the vehicle and ground support equipment. Those plans were later scrapped, and the abort test will be performed using an entire Falcon 9 Block 5 rocket and will be used as a test of the fueling procedure in order to human-rate the Falcon 9 rocket for NASA's Commercial Crew Program. 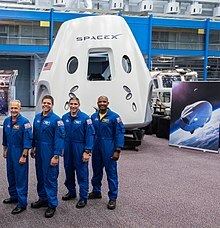 Crew Dragon 2 mockup (background) and the astronauts selected for its first two crewed missions (foreground), from left to right: Douglas Hurley, Robert Behnken, Michael Hopkins and Victor Glover. In 2015, NASA named its first Commercial Crew astronaut cadre of four veteran astronauts to work with SpaceX and Boeing – Robert Behnken, Eric Boe, Sunita Williams, and Douglas Hurley. The SpX-DM2 mission will complete the last milestone of the Commercial Crew Development program, paving the way to starting commercial services under an upcoming ISS Crew Transportation Services contract. On August 3, 2018 NASA announced the crew for the DM-2 mission. The crew of two will be formed by NASA astronauts Bob Behnken and Doug Hurley. Behnken previously flew as mission specialist on the STS-123 and the STS-130 missions. Hurley previously flew as a pilot on the STS-127 mission and on the final Space Shuttle mission, the STS-135 mission. The first orbital test of Crew Dragon 2 was an uncrewed mission, designated SpX-DM1 and launched March 2, 2019. The spacecraft tested the approach and automated docking procedures with the ISS, remained docked until March 8, 2019, then conducted the full re-entry, splashdown and recovery steps to qualify for a crewed mission. Life-support systems were monitored all along the test flight. The same capsule was planned to be re-used in June for an in-flight abort test, however due to the April 20th, 2019 anomaly, C201 is no longer available for this test.As of February 2019[update], Dragon 2 is scheduled to carry its first crew of two NASA astronauts on a 14-day test-flight mission to the ISS in July 2019. CST-100 Starliner, a crewed spacecraft being built by Boeing for the Commercial Crew Development program in competition with Crew Dragon 2 and is scheduled for launch in 2019. Dream Chaser, a cargo spaceplane being developed by Sierra Nevada Corporation for CRS-2 with a proposed crew variant. Federation (spacecraft) – a reusable next-generation crewed spacecraft proposed in Russia in the late 2000s. The company building it "striving to launch" it prior to 2024. Orion (spacecraft), a crewed spacecraft being built for NASA by Lockheed Martin. Its next launch[clarification needed] is scheduled for 2020. ^ "DragonLab datasheet" (PDF). Hawthorne, California: SpaceX. 8 September 2009. Archived from the original (PDF) on 4 January 2011. Retrieved October 19, 2010. ^ ""Commercial Crew Program American Rockets American Spacecraft American Soil" (page 15)" (PDF). NASA.gov. NASA. Retrieved 28 February 2019. ^ a b c d e f SpaceX (2019-03-01). "Dragon". SpaceX. Retrieved 2019-03-03. ^ a b Audit of Commercial Resupply Services to the International Space Station. NASA. April 26, 2018. Report No. IG-18-016. Quote: "For SpaceX, certification of the company’s unproven cargo version of its Dragon 2 spacecraft for CRS-2 missions carries risk while the company works to resolve ongoing concerns related to software traceability and systems engineering processes." ^ a b c d e f g "NASA, Partners Update Commercial Crew Launch Dates". NASA Commercial Crew Program Blog. February 6, 2019. Retrieved February 6, 2019. ^ "Final Environmental Assessment for Issuing an Experimental Permit to SpaceX for Operation of the DragonFly Vehicle at the McGregor Test Site, McGregor, Texas" (PDF). faa.gov. Federal Aviation Administration. pp. 2–3. Retrieved August 22, 2014. ^ Gwynne Shotwell (March 21, 2014). Broadcast 2212: Special Edition, interview with Gwynne Shotwell (audio file). The Space Show. Event occurs at 24:05–24:45 and 28:15–28:35. 2212. Archived from the original (mp3) on 2014-03-22. Retrieved 2014-03-22. we call it v2 for Dragon. That is the primary vehicle for crew, and we will retrofit it back to cargo. ^ "SpaceX Completes Key Milestone to Fly Astronauts to International Space Station". SpaceX. October 20, 2011. Retrieved May 9, 2012. ^ "Dragon Overview". SpaceX. Retrieved April 16, 2012. ^ Bayt, Rob (July 16, 2011). "Commercial Crew Program: Key Driving Requirements Walkthrough". NASA. Archived from the original on March 28, 2012. Retrieved July 27, 2011. ^ Oberg, Jim (March 28, 2007). "Space station trip will push the envelope". MSNBC. Retrieved May 9, 2012. ^ Bolden, Charles (May 9, 2012). "2012-05-09_NASA_Response" (PDF). NASA. Retrieved June 20, 2012. ^ With the exception of the Project Gemini spacecraft, which used twin ejection seats: "Encyclopedia Astronautica: Gemini Ejection" Archived 2005-04-25 at the Wayback Machine. Astronautix.com. Retrieved January 24, 2013. ^ Chow, Denise (April 18, 2011). "Private Spaceship Builders Split Nearly $270 Million in NASA Funds". New York: Space.com. Archived from the original on December 18, 2011. Retrieved 18 December 2011. ^ "Spaceship teams seek more funding" Archived March 4, 2012, at the Wayback Machine. MSNBC Cosmic Log. December 10, 2010. Retrieved December 14, 2010. ^ a b "SpaceX Updates – Taking the next step: Commercial Crew Development Round 2". SpaceX. January 17, 2010. Retrieved January 17, 2011. ^ "In the news Paragon Space Development Corporation Joins SpaceX Commercial Crew Development Team". Paragon Space Development Corporation. June 16, 2011. Archived from the original on January 7, 2012. Retrieved April 15, 2012. ^ Sofge, Eric (19 November 2012). "The Deep-Space Suit". PopSci. Retrieved 19 November 2012. ^ Star Wars: The Battle to Build the Next Shuttle: Boeing, SpaceX and Sierra Nevada. Bloomberg News. May 2014. Event occurs at 2:05. Retrieved May 6, 2014. ^ "SpaceX scrubs launch to ISS over rocket engine problem". Deccan Chronicle. May 19, 2012. Archived from the original on May 23, 2012. Retrieved May 23, 2012. ^ a b c d Norris, Guy (May 30, 2014). "SpaceX Unveils 'Step Change' Dragon 'V2'". Aviation Week. Retrieved May 30, 2014. ^ a b Kramer, Miriam (May 30, 2014). "SpaceX Unveils Dragon V2 Spaceship, a Manned Space Taxi for Astronauts — Meet Dragon V2: SpaceX's Manned Space Taxi for Astronaut Trips". space.com. Retrieved May 30, 2014. ^ a b Bergin, Chris (May 30, 2014). "SpaceX lifts the lid on the Dragon V2 crew spacecraft". NASAspaceflight.com. Retrieved May 30, 2014. ^ Post, Hannah (2014-09-16). "NASA Selects SpaceX to be Part of America's Human Spaceflight Program". SpaceX. Retrieved 2019-03-03. ^ a b Oct 11; First, 2014 Guy Norris | AWIN. "Why NASA Rejected Sierra Nevada's Commercial Crew Vehicle". aviationweek.com. Retrieved 2019-03-03. ^ Berger, Eric (June 9, 2017). "So SpaceX is having quite a year". Ars Technica. Retrieved June 9, 2017. ^ Clark, Stephen (2014-10-09). "NASA clears commercial crew contractors to resume work". Spaceflight Now. Retrieved 2014-10-10. a highly-modified second-generation Dragon capsule fitted with myriad upgrades and changes – including new rocket thrusters, computers, a different outer mold line, and redesigned solar arrays – from the company's Dragon cargo delivery vehicle already flying to the space station. ^ Ralph, Eric (2018-08-28). "SpaceX has no plans to reuse Crew Dragon spaceships on NASA astronaut launches". TESLARATI.com. Retrieved 2019-02-25. ^ a b c d e Bergin, Chris (2014-08-28). "Dragon V2 will initially rely on parachute landings". NASAspaceflight.com. Retrieved 2014-08-29. ^ Ralph, Eric (17 March 2019). "SpaceX's Crew Dragon could land with abort thrusters in emergencies, says Musk". teslarati.com. Retrieved 17 March 2019. ^ "Dragon". spacex.com. Retrieved 4 March 2019. ^ Gibbens, Sarah. "A First Look at the Spacesuits of the Future". nationalgeographic.com. National Geographic. Retrieved 4 March 2019. ^ "NASA Chooses American Companies to Transport U.S. Astronauts to International Space Station". Retrieved 2014-09-16. ^ a b c d Bergin, Chris (March 5, 2015). "Commercial crew demo missions manifested for Dragon 2 and CST-100". NASASpaceFlight.com. Retrieved March 7, 2015. ^ a b "NASA's Commercial Crew Program Target Test Flight Dates". NASA. November 21, 2018. Retrieved November 22, 2018. ^ Garcia, Mark (2018-08-17). "NASA, SpaceX Agree on Plans for Crew Launch Day Operations". NASA. Retrieved 2018-11-25. ^ Bridenstine, Jim. "NASA has been notified about the results of the @SpaceX Static Fire Test and the anomaly that occurred during the final test. We will work closely to ensure we safely move forward with our Commercial Crew Program". TWITTER. Retrieved 21 April 2019. ^ Gebhardt, Chris (August 11, 2017). "SpaceX and Boeing in home stretch for Commercial Crew readiness". NASASpaceFlight.com. Retrieved August 17, 2017. ^ a b c "SpaceX's Crew Dragon spacecraft suffers an anomaly during static fire testing at Cape Canaveral – NASASpaceFlight.com". Retrieved 2019-04-21. ^ Clark, Stephen (May 6, 2015). "SpaceX crew capsule completes dramatic abort test". Spaceflight Now. Retrieved May 14, 2015. ^ Bergin, Chris (April 3, 2015). "SpaceX preparing for a busy season of missions and test milestones". NASASpaceFlight.com. Retrieved April 4, 2015. ^ "SpaceX Crew Dragon pad abort: Test flight demos launch escape system". CollectSpace. May 6, 2015. Retrieved May 14, 2015. ^ Bergin, Chris (May 6, 2015). "Dragon 2 conducts Pad Abort leap in key SpaceX test". NASASpaceFlight.com. Retrieved May 6, 2015. ^ Dragon 2 Propulsive Hover Test. SpaceX. January 21, 2016. Retrieved January 21, 2016. ^ Bergin, Chris (2015-10-21). "SpaceX DragonFly arrives at McGregor for testing". NASASpaceFlight.com. Retrieved 2015-10-30. ^ Richardson, Derek (30 July 2016). "Second SpaceX Crew Flight Ordered by NASA". Spaceflight Insider. Retrieved 9 August 2016. Currently, the first uncrewed test of the spacecraft is expected to launch in May 2017. Sometime after that, SpaceX plans to conduct and in-flight abort to test the SuperDraco thrusters while the rocket is traveling through the area of maximum dynamic pressure – Max Q. ^ "NASA signs off on SpaceX's "load-and-go" procedure for crew launches". August 9, 2018. Retrieved August 9, 2018. ^ a b Siceloff, Steven (July 1, 2015). "More Fidelity for SpaceX In-Flight Abort Reduces Risk". NASA. Retrieved June 19, 2016. In the updated plan, SpaceX would launch its uncrewed flight test (DM-1), refurbish the flight test vehicle, then conduct the in-flight abort test prior to the crew flight test. Using the same vehicle for the in-flight abort test will improve the realism of the ascent abort test and reduce risk. ^ a b Bergin, Chris (April 10, 2015). "SpaceX conducts tanking test on In-Flight Abort Falcon 9". NASASpaceFlight.com. Retrieved April 11, 2015. ^ "NASA assigns 4 astronauts to commercial Boeing, SpaceX test flights | collectSPACE". collectSPACE.com. Retrieved 2019-03-03. ^ Kramer, Miriam (January 27, 2015). "Private Space Taxis on Track to Fly in 2017". Scientific American. Retrieved January 27, 2015. ^ "NASA Assigns Crews to First Test Flights, Missions on Commercial Spacecraft". NASA. August 3, 2018. Retrieved August 4, 2018. ^ "Crew Demo 1 Mission Overview" (PDF). SpaceX. March 2019. Retrieved March 3, 2019. ^ "Dragon C2, CRS-1,... CRS-20 (SpX 1,... 20)". space.skyrocket.de. Retrieved 2019-03-03. ^ Clark, Stephen (6 May 2015). "SpaceX crew capsule completes dramatic abort test". Spaceflight Now. Retrieved 6 May 2015. ^ "Boeing, SpaceX Secure Additional Crewed Missions Under NASA's Commercial Space Transport Program – GovCon Wire". ^ a b "NASA Awards International Space Station Cargo Transport Contracts" (Press release). NASA. January 14, 2016. Retrieved August 24, 2017. This page was last edited on 24 April 2019, at 16:58 (UTC).